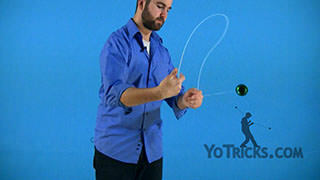 Learn the basic throw, mount, and bind techniques for horizontal style yoyoing. 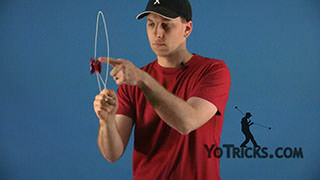 Horizontal Yoyoing Basics: Throw, Mount, Bind Yoyo TrickWhen you get into horizontal style play, you are going to have to learn all the fundamentals before you can actually start learning tricks. 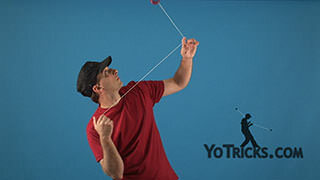 So in this video, that is what we are going to do, we are going to teach you how to throw, mount, and bind your yoyo in horizontal style play. 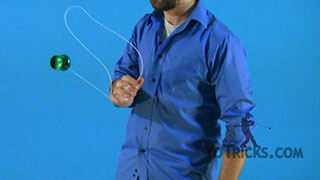 One thing that you may have already noticed is that I have cut my string just a little bit shorter for this video. That is because when you are learning the basics of horizontal style play, it is quite a bit easier when your string is shorter. There is a couple of reasons for this. 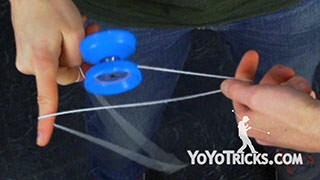 the first one is that when your string is shorter, it is easier to go faster. 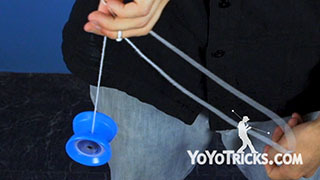 The more horizontal your tricks are, the more important speed is because it is going to keep the yoyo on the string, it is going to help you keep everything under control. So a shorter string helps with that. 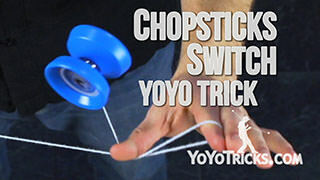 The second thing is when you are first learning these tricks, they can be kind of scary because yoyo kind of looks like it is going to swing around and might hit you in the face, and that can happen, so when you are practicing getting a shorter leash on this beast just makes it a little bit safer, at least it feels safer, which will allow you to attempt these tricks without fear, which definitely helps a lot. 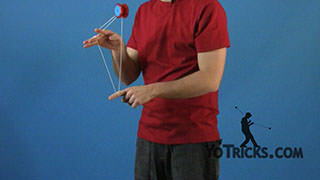 When we are first learning, if you think about it, there is a couple of things if you use and unresponsive yoyo that you have to learn at the same time. 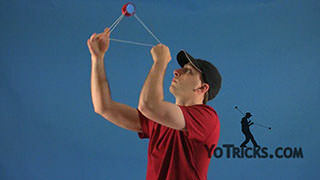 Not only do you have to learn how to throw it, but you also have to learn how to mount and bind if you want to keep practicing. 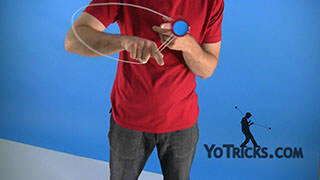 So what we recommend is when you are learning the throw in particular, just get out your responsive yoyo. You can learn the throw on that first. 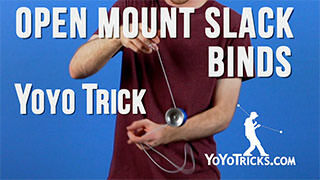 You can even learn the mount without ever having to worry about the bind, which can be tricky to learn on it. 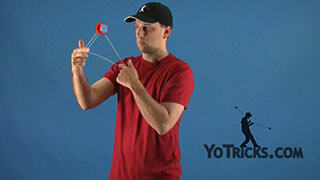 That is why recommend starting with a responsive yoyo. 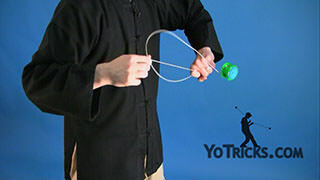 With the throw, pretty much the basic horizontal throw is just a breakaway. But, it is done horizontal. If you have watched our breakaway video, you will know that we showed it to you in two different ways. 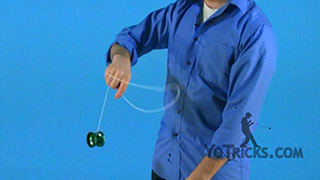 The first one was to hold the yoyo the way that you normally do, and just turn to the side and throw the yoyo like that. 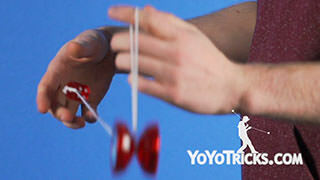 Then there was a second way where the yoyo actually faces forward, it is already on the plane it is going to be on. You can throw like that. 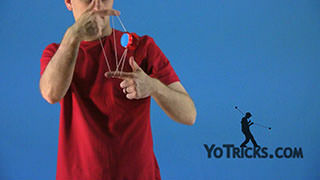 With horizontal style yoyoing, you can go with both of those options, but watch what happens if you try to go horizontal with this first method. 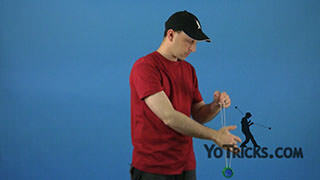 In order to get the yoyo to level out, see how far I have to rotate my hand around? My hand is practically upside down. It is pretty uncomfortable to do this. You can get a horizontal style throw that way, but just that awkwardness and you almost have to lean in able to get it all the way over, it can make it a little bit more tricky, even if at first it seems to make more sense that way. What we would recommend is just holding it in your hand like this. Now my palm is basically facing up, it is a very comfortable position. Again, this is just the same as our set up for the other breakaway throw. 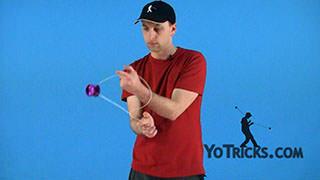 With this, it is pretty easy to get a horizontal style throw and there is none of that discomfort. 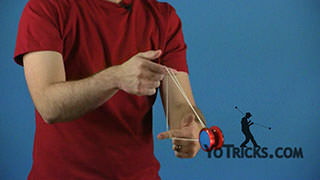 If you want to kind of go in between, you can also do more of a 5A style hold, where you have got your thumb around it. Again, this is a little bit more comfortable than the first method, but not quite as good as the second one, but this is just the type of thing that you are going to have to experiment with and figure out what works for you. 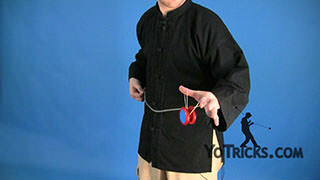 One thing that you are going to have to deal with in horizontal style yoyoing, especially when you are first learning that is not so much of a problem in regular style is what is called precession. 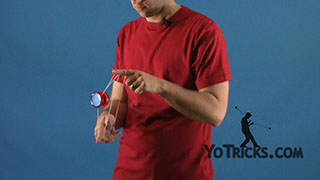 Precession is the tendency that a yoyo has to turn along the axis on which it is spinning. 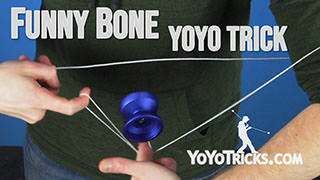 Just to be clear, what we are talking about is, again, we are not talking about the spin of the yoyo, and we are not talking about the way it tilts, we are talking about its tendency to turn. 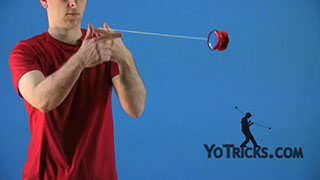 The reason that this is a problem when you are getting into horizontal style yoyoing is if you imagine you throw your yoyo and lets say you miss the first mount, the yoyo is already going to start to precess. It is going to start to turn so that you are going to have to turn your body with it in order to line up the mount. If you think about just a regular trapeze, you can see why this would be a problem. 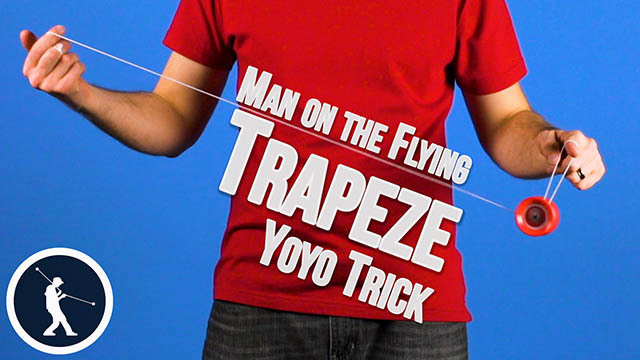 On your normal trapeze, all the strings are always aligned with the groove of the yoyo. 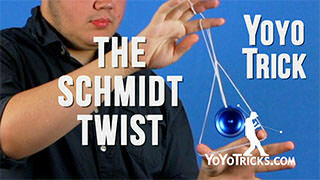 Imagine that the yoyo began to turn on you, or we can simulate this by just having me turn around the yoyo. 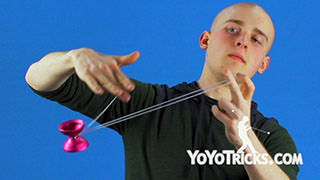 If I were to try to mount the yoyo like this, it just is not going to happen because the strings are not aligned with the groove of the yoyo. The same thing is true when the yoyo begins to precess in off axis, you always have to re-orient yourself so that the groove of the yoyo is facing you and that way you can get into your mount. The better that you get at horizontal style play, this will become less and less of an issue, but it is certainly something that you have to think about when you are first getting started. Like we talked about in our trapeze video, while you are working on the breakaway, you might as well be working on your first mount trick. The same thing is true with horizontal style play. While you are working on the throw, you might as well be working on the mount there as well. In one sense, you could think about it just like the trapeze where you can go right from the throw immediately into the catch. There is really nothing wrong with that. 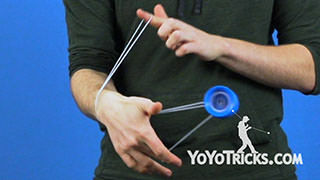 But, horizontal players have developed a technique that is called the banana turnover that gives them a little bit more leeway when getting into this trick. I think as a new player, you will find that it is extremely helpful. In order to do the banana turnover, what you are going to do is position your hand forward with your thumb facing down. What is nice about this is you have this whole area right here to catch the string when you throw it across. Like we said, when you are first getting into this, everything can feel kind of out of control. This is a way to gain a little of that control back. 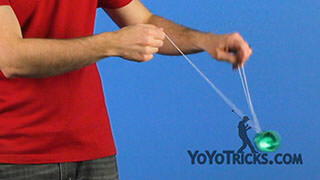 What you are going to do is you are going to throw the yoyo and the string is going to go into this part of your hand. 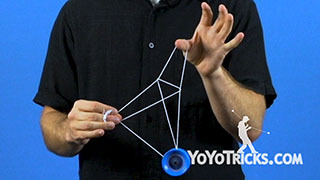 If you think about it, if you were to just pinch your thumb, the yoyo is just going to orbit underneath. 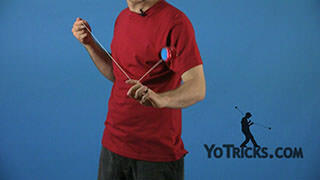 So that is one good way to practice your throw. Just allow it to do a couple of pinwheels. 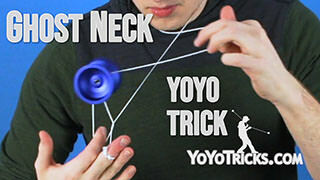 Then bring the yoyo right back. 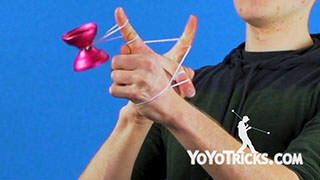 Ultimately, what you want to do is you want it to pinwheel once, and then as the yoyo passes under the string coming off of your yoyo hand, you are going to lift your thumb up, transfer the string onto your first finger, and attempt your first mount. 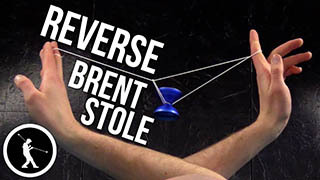 If you think about it, the banana turnover functions in horizontal style play the same way that the pinwheel can function when you are getting into your side mount tricks. 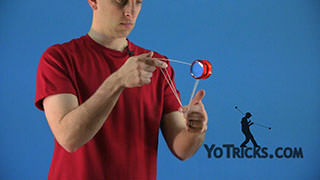 What I mean by that is it allows your to control the speed of the motion of the yoyo, even coming off of a hard throw. 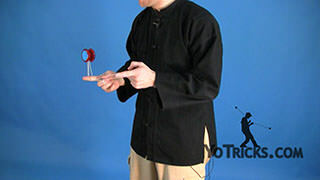 What you will notice me doing a lot of times, especially when I am throwing the yoyo very hard in the tutorials, is I will do one pinwheel and that allows me to slow the yoyo down so that I can control it when it gets into the pinwheel. Instead of having all that speed go right onto the trapeze. The same thing is true, maybe even more so in horizontal style play. Part of that is that it is really important to have a powerful throw. 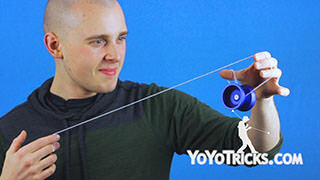 It is good to have a technique where you can slow that motion down so that you can get the yoyo onto the string. 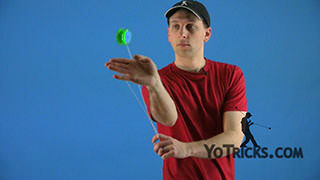 Now, the reason that it is so important to have a powerful throw in horizontal style play is because the faster the yoyo is spinning, the more it is going to resist that tendency to precess. It is going to resist turning. 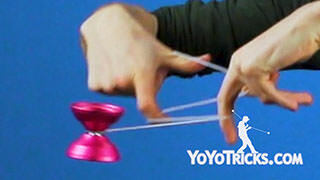 It will also resist the tendency for the yoyo to change its tilt. This is something that I have seen a lot with new players. You know you always tell them when you get into horizontal style play, you have got to throw hard and everyone knows that. 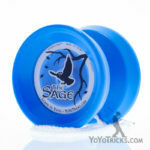 But because the throw is new, a lot of people thing that they are throwing their yoyo as hard as anyone has ever thrown anything. In fact, their throw is actually really weak. 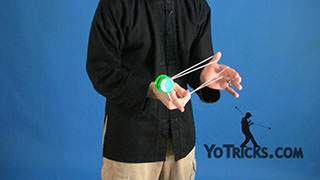 Because it is weak and slow, the yoyo is already going to start to precess on them. It is going to start to turn. 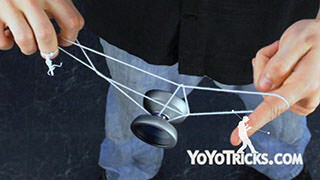 So by the time they get set up for their mount, their yoyo has already turned so much that they are not going to be able to line up the mount the way that they want. So the banana turnover can also help us with this. 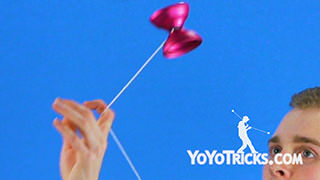 What you can actually do is you can do a couple of pinwheels quickly under your hand. What that will do is it will control that precession. 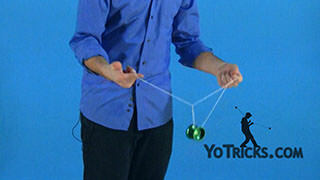 It will keep the yoyo at the same angle in line with your body. That way it is lined up perfectly for the mount. 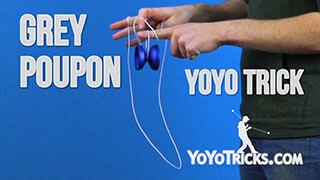 One final thing to think about before switching over to our unresponsive yoyo, and that is about controlling tilt. When you first get into your first mount, a lot of times this what is going to happen. 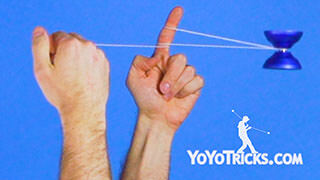 You get it on the string, and the yoyo all of a sudden rights itself. That can be really irksome because you are trying to keep it on that horizontal plane. Really, there is nothing new to learn here, it is just being applied here in a different way. 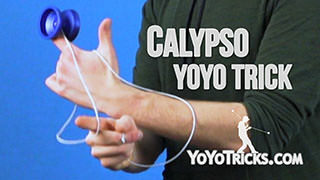 So again if you think about the Trapeze, what we already know is if you push the string into the side of the yoyo, that is going to cause it to tilt. 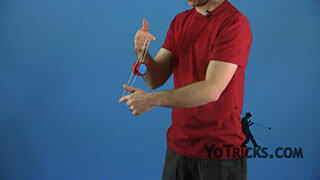 What is a little bit different when you get into horizontal style play is if the yoyo is just sitting in a mount, the strings are always going to be pushing into the side of the yoyo. But you still have a level of control. Watch this. 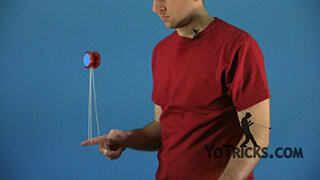 You can actually balance your hands in such a way so that the lean on the yoyo pretty much stays still. 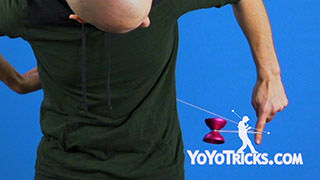 If you find that the yoyo is constantly leveling itself out, all that means is that your yoyo hand is being just a little bit too low. 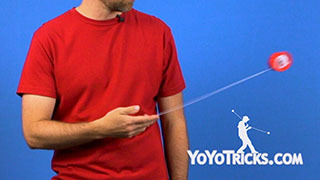 On the other hand, if you find that it keeps going more and more horizontal until it falls right off the string, that means that your yoyo hand is just a little bit too high. 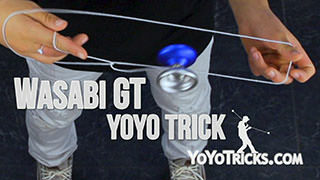 As you are doing tricks, this is going to be kind of a repeated thing that you will find that the yoyo is going to be constantly changing tilt and twisting in ways that you do not want it to. 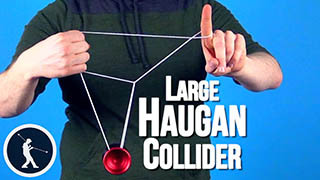 Just remember all the physics are exactly the same, it just has to do with the placement of your hands, how the strings are pushing into the side of the yoyo. 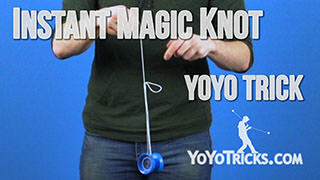 It is a good idea with just this first mount to kind of get control of that and figure out what is going on so you can control how the yoyo sits on the string. That will help you out as you move forward. 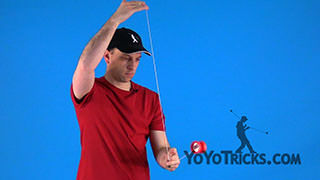 Once you have mastered the banana turnover and you can consistently get the yoyo onto the string, you are ready to learn how to bind, which means that you want to switch over to your unresponsive yoyo. 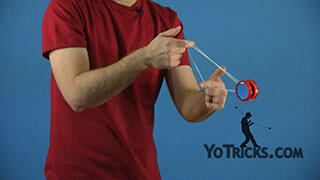 The bind is going to be a little bit more tricky to learn than just getting the yoyo onto the string. 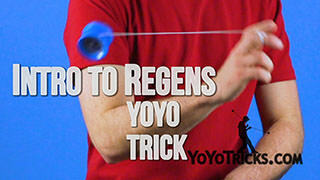 There is a couple of things that we recommend you think about when you get to this point in the trick. The first one you may have already seen me do. Sometimes when I am doing the tricks they are all the way up here. They are almost perfectly horizontal. But a lot of times in this video, I keep it a little bit lower. Almost at like a 45 degree angle. When you are practicing, it is a good idea to do that. It gives you more time to think about the trick. 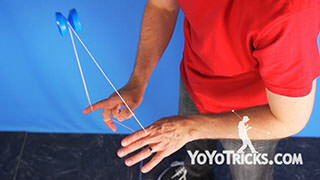 It is not quite as risky if the yoyo is not constantly falling out of the string. So if you practice, you can kind of learn them at that angle and then bring them all the way up when you want to show off to other people. 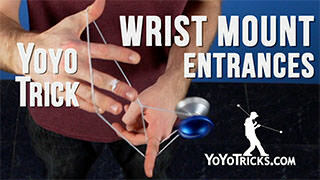 The other thing is once you start getting into more complicated tricks, I would say in horizontal, the binds qualify, you absolutely have to master them perfectly first, almost mindlessly, on the regular mount. In this case, these are all going to be side mount tricks. Once you can do them without thinking about it at all, then you can put it in a horizontal position because you are already kind of distracted managing all of the stuff in horizontal style play. 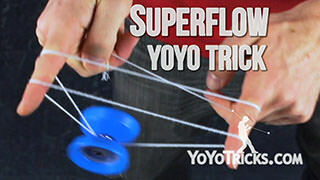 You do not also need to be thinking about figuring out how the trick works. In this video, what we have decided to do is we wanted to teach you three different alternatives that you can use when first learning to bind horizontal. The reason is because none of these binds are perfect. They all have advantages, and they all have disadvantages. So we figured we would just let you choose which one you think would be the best to learn. It is a good idea to learn all of them of course. But you probably want to use the one you are already most familiar with on the side mount. That will get you where you want to go as quickly as possible. 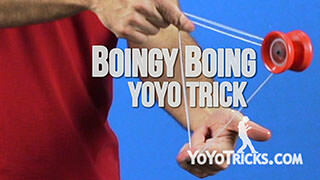 The first one is the bind that we taught at the end of our man on the flying trapeze video. 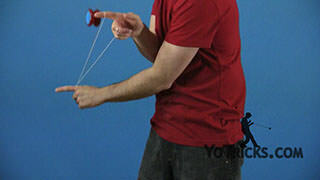 That is just this one, where you hook the string with your yoyo hand. 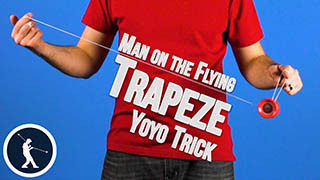 On the trapeze, you can see that this one is pretty simple because of the way gravity handles the yoyo. It just sits there waiting for you to hook it. Unfortunately, with horizontal style play, that does not happen. 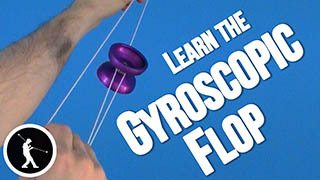 As soon as you are ready to hook it, gravity is already pulling it out of the plane that you need it in in order to land the trick. You can see it is already way lower than you want it to be. 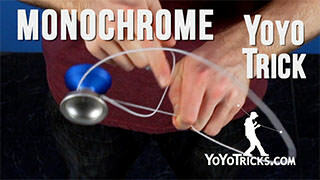 Of course then you have to go around chasing the yoyo to set up your next bind. There is two ways to deal with what gravity is doing to you. The first one is to just try to do it so fast that gravity is not an issue. 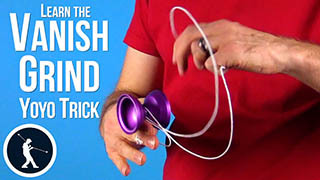 If you can do it fast enough, it will still be on plane enough for your to land the trick. The one downside to doing this bind quickly is that if you happen to miss the string coming off your yoyo hand, it is pretty easy to lose control and have the yoyo come back and hit you in the face. 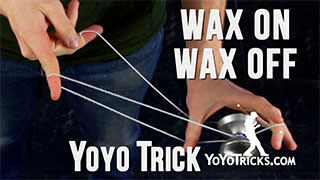 So if you do not want to take that risk, you can cheat it a little bit by just allowing gravity to pull the yoyo down and then you pop it back up and hook it with your hand to make the bind work. 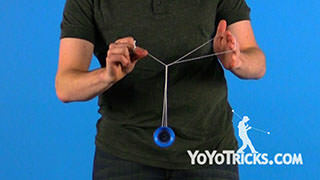 The one downside of this is that when you allow gravity to pull the yoyo down, the string is going to push up against the side of the yoyo, which will cause the yoyo to precess. 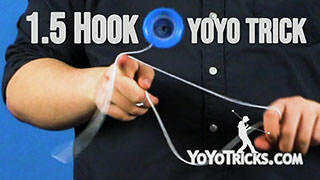 You are going to have to turn with the yoyo when you do this particular method so that you can line up the string perfectly and hit that particular bind. 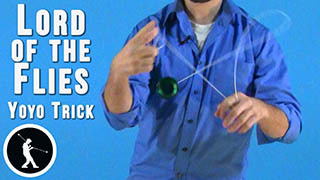 The second bind and the third bind are from our Go-To Binds video. The second one is this right here. Again, if you look at this on the side mount, you can see that you can kind of take your time with it. When you set up the bind before you reverse the motion, gravity is just going to hold it here in place. 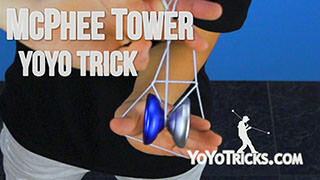 Then you can finish the trick. The nice thing about this is that it is very consistent bind. On horizontal, it is very consistent as well, so a lot of players end up defaulting to this particular bind. 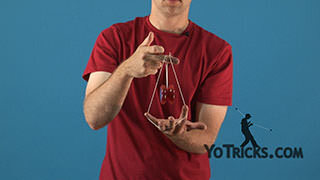 In that directional change, again, you do not have the luxury of letting it hang out while you think about the rest of the trick, you need to do that more quickly. 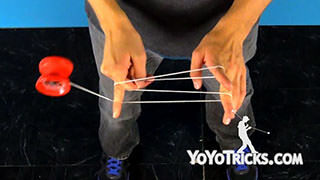 If you have really mastered this particular bind, it is not too tricky to get it down, it is just something that you have to think about. 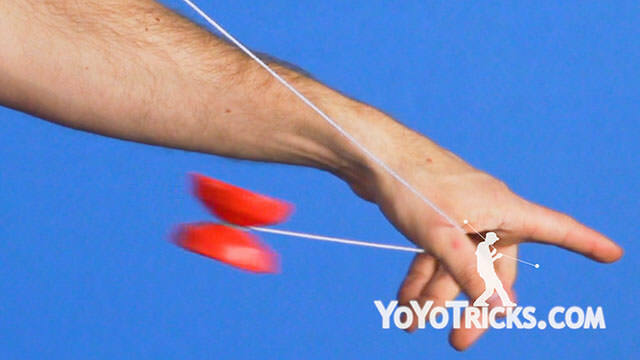 Also, when it is changing direction, with gravity, again, it is going to be pulling the yoyo down, so you are going to have to lift the yoyo back up just a little bit. In no time, that will feel natural, but it is just one more thing to think about and if you are just learning these tricks for the first time, that can throw you off a little bit. Because of that, the third bind might be the bind of choice for a lot of players. 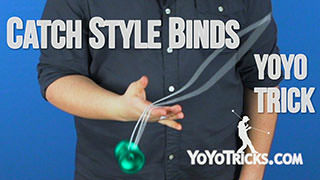 Again, this was in our Go-To Bind video. That was this one right here. The nice thing about this is that this bind is really straightforward. 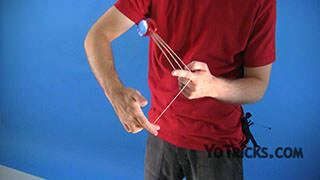 Just like we talked about in that bind video, it is also a bind that is a lot harder to get consistent and to hit that bind without getting a tail. 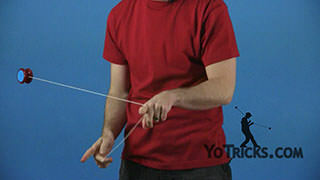 The nice thing about using it in horizontal tricks is that it really works with the flow of the trick because once you get it set up for the bind, you just swing your arms over in the same direction and you can do the rest of the trick. This is going to take some practice to land this without a tail. Again, you are just getting started here. It is fine to work with each one, figure out which bind is going to work for you. Master that one before you move on to the others. 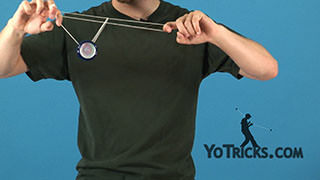 Horizontal style yoyoing, like a lot of yoyoing, it takes a lot of practice. 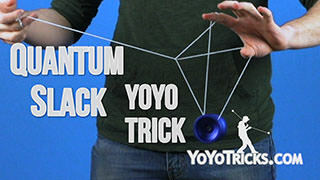 Even if you understand and digest everything that we say in this video, it is still going to take a lot of work for you to be able to hit the tricks the way that you want and to start to feel comfortable with it. 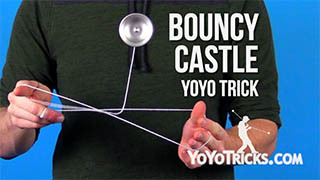 The tricks are so impressive and once you get good at them, it is a lot of fun for you and it is a lot of fun for people who get to see you do those tricks, so it is definitely worth putting in the time. 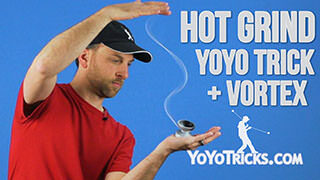 So this is how you get started with horizontal style yoyoing.